With finals in the not-so-distance future, I needed a feel good movie. "Parental Guidance" is my choice for this week. The movie starts with very modern and helicopter-like parents Alice (Marisa Tomei) and Phil (Tom Everett Scott) who need to get away for a week so they call in the grandparents to watch the kids. Alice is reluctant to leave her parents, Artie (Billy Crystal) and Diane (Bette Midler), alone with her three kids. Artie and Diane’s parenting tactics are very different than those of Alice and Phil. Grandma Diane desperately wants to earn the affections of grandkids, and Artie faces challenges when it comes to trying to follow his daughters rules for parenting her children. Artie and Diane’s week with their grandkids was anything but perfect but it ultimately brought them all closer together, and Alice discovered that maybe her parents did know what they were doing after all. 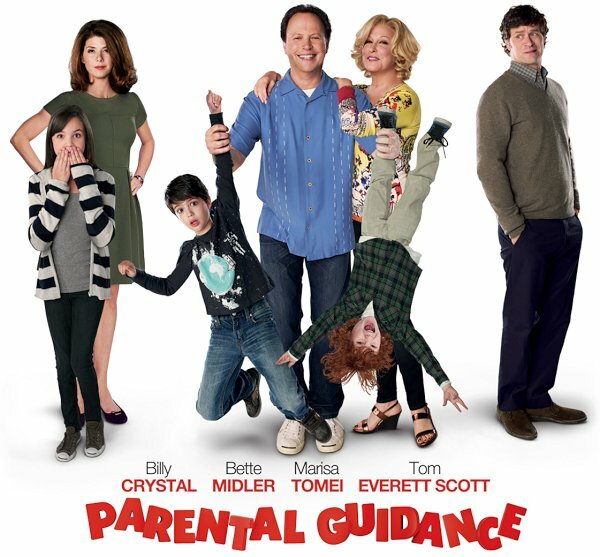 "Parental Guidance" didn’t get the best reviews, but I really liked it. I found it endearing and found myself crying at the close of the movie. The movie has been accused of being predictable, but in my opinion, most of these types of movies are and I don’t think that’s always a bad thing. I thought this movie was sweet, genuine, and it even had its humorous moments. Billy Crystal and Bette Midler had an interesting dynamic, and the grandkids were adorable and made me giggle. If you’re like me and into all that sappy feel good stuff I say ignore the critics and rent this one.